The old Bluff hut was dismantled and moved about 150 metres in 2010. At the same time it got a substantial upgrade and is now like a new hut. It has a fire again. (the old hut had one in its early days but it was removed at some stage) The hut has tank water, is fully lined and insulated, has double glazed windows, a deck, porch etc. It is now wired down because the new site is more exposed than the old one. The bunk numbers have been increased from four to six. I congratulate DOC on this effort. It's now a top hut! The location is in the headwaters of the Hokitika River on the TL where the toe of Conway Ridge meets the top of the Bluffs that the Hokitika flows over to meet the Mungo River. Views from the new hut are outstanding! lewshaw Good to read your comments,Glennj;you`ve been round the block by the sound of.Mags & I had a couple of pit days in the new Bluff Hut-not a bad place to be stuck in.Had muted views when we left but will have to go back.Keen to have a look at Sir Robert Hut . glennj Winter access is possible but more difficult than summer or autumn access. From late May there is usually snow on the saddles and other higher parts of the routes in. 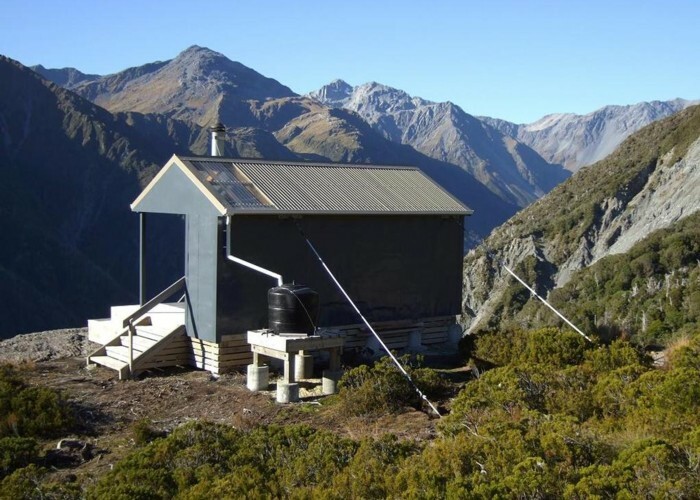 strider That's one seriously cool looking hut and location.Can't wait to visit it.Whats it like for winter access? Added 2 May 2011 by glennjglennj. 3 revisions, most recently 3 May 2011 by glennjglennj. 128 views in the past year (11 per month).